Not only absolutely delicious, of the full range of fruits and vegetables, blueberries are ranked number one in terms of their antioxidant benefits. 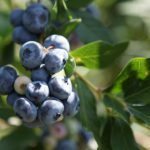 Whether you grow your own or go to a U-Pick the questions are when is blueberry harvesting season and how to harvest the blueberries? Blueberry bushes are suited to USDA hardiness zones 3-7. The blueberries we eat today are a more or less recent invention. Prior to the 1900’s, only North American natives utilized the berry, which, of course, was only found in the wild. There are three types of blueberry: highbush, lowbush and hybrid half-high. Regardless of the type of blueberry, combine their nutrition aspects with ease of growing and minimal diseases or pests (except the birds!) and the only question is when to harvest blueberry bushes? Harvesting blueberries is a simple process but, even so, there are a few things to keep in mind. First off, don’t rush to pick the berries too soon. Wait until they turn blue. They should fall off right into your hand with no tugging on the delicate berry required. 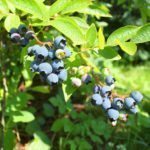 Blueberry harvesting season can be anywhere from late May through mid-August, depending upon the variety and your local climate. For a more bountiful crop, plant two or more varieties. Blueberries are partially self-fertile, so planting more than one varietal can extend the harvest season as well as inducing the plants to produce more and larger berries. Keep in mind that full productions may take until the plants are about 6 years of age. There’s no great secret to picking blueberries. Beyond the actual picking of the blueberries, there isn’t an easier fruit to prepare and serve. You don’t need to peel, pit, core or cut plus they freeze, can or dry for long-term storage if you don’t make short work of them as a pie, cobbler or just a snack. When harvesting blueberries, choose those that are blue all the way around the berry – white and green blueberries do not ripen further once they are picked. Berries with any blush of red are not ripe, yet may ripen further once picked if kept at room temperature. That said though, you really want to only pick ripe gray-blue berries. The longer they stay on the bush to ripen fully, the sweeter the berries become. Gently, using your thumb, roll the berry off the stem and into your palm. 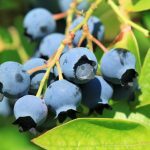 Ideally, once the first berry is picked, you will place it in your bucket or basket and continue in this vein until you have harvested all the blueberries you want. However, at this juncture, I can never really resist tasting the first blueberry of the season, just to be sure it’s really ripe, right? My periodic tasting tends to continue throughout the picking process. Once you are done harvesting the blueberries, you can use them immediately or freeze them for later use. We like to freeze them and throw them straight from the freezer into smoothies, but however you decide to use them, you can be assured their amazing nutritive properties are well worth an afternoon at the berry patch.